Back in 2016, it was kind of entertaining. "Oh, look, those jeans have cut-out pockets that reveal your hips—who would wear them, how and why?" or "Did you see Gigi's jeans had more holes than actual jean? Celebs do the funniest things," we would say. After an initial boom early that year (it turns out that Hadid's approval of One Teaspoon's savagely ripped-apart slouchy denim played a big part in the brand becoming one of the most engaged in its field on Instagram), we saw designer brands and high-street labels alike taking the concept and running with it: Since then, we've witnessed chaps-jeans at Topshop (a hybrid that Christina Aguilera would have been thrilled to own circa 2002). There were jeans with huge panels removed and replaced with clear PVC (comfy). 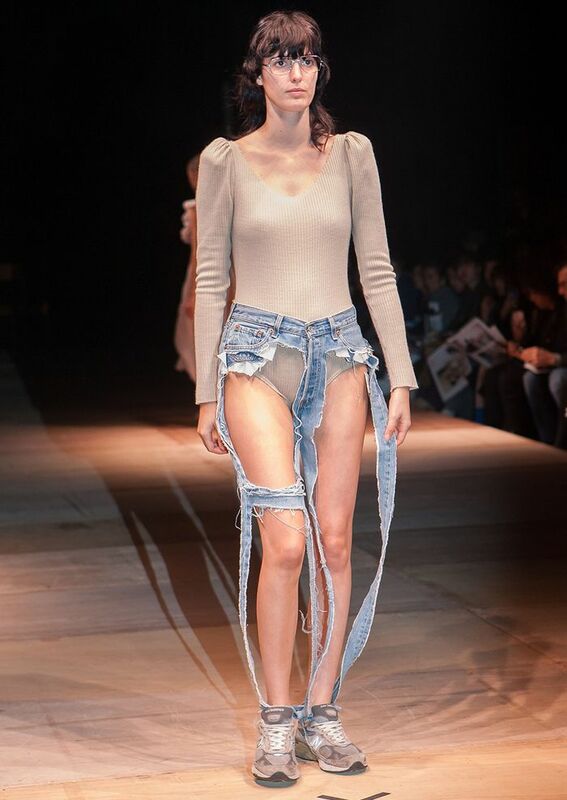 We've had the "thong" jean making itself known on runways in Japan. Jeans with tears raging up each side so you had a flappy flared denim party happening going on. Unravel's Inside out jeans and Vetements's jeans with zippers that went all the way from the back to the front were, in the grand scheme of this random realm, subtler, wearable and luxe. Later in 2017, we also went through a phase where fishnet tights were the thing to wear under your barely there jeans—remember? Each time these products have launched onto the market, a flurry of news content ensues. Outrage, confusion and plenty of fashion bashing from both media outlets and the general public have been at the core of the coverage, and we totally understand why when you look at the latest two additions to this bizarre category just this week. Fashion Nova's lace-up jeans have been met with many questions, including some basics, like just how you would even try to get a pair of these on? We all know how a pair of gladiator sandals can take a good 20 minutes, so these could require you to reschedule your entire day. A similarly explosive reaction has been the case for that is basically a pair of teeny tiny shorts with a few denim straps reaching to where a hemline would normally be on your ankles. Kendall Jenner was ahead of the pack on this one, wearing shredded jorts way back in October 2017. The cynic—and classic denim lover—in me questions whether a) anyone is actually buying these jeans (if so, please let us know) and b) are brands now just taking the idea to a bizarre level for press coverage? These are two brands that aren't often covered in the mass media thanks to their cult online status, but this denim duo of daring designs has put them on the map—and lest we not forget, all press is apparently good press. If this denim moment is your idea of hell, please check out our edit of the best straight-leg (super-simple) jeans out there instead.